I'm allergic to dust and I live in a fairly dry climate, so my lab accumulates dust at an amazing rate. I decided to look into the issue, by identifying where the hot-spots are and running a few experiments with humidifiers and logging the quantity of dust over time. I came across the GP2Y1014AU0F PM2.5 module and I bought one for about $5. I didn't know anything about it at the time of the purchase, so I didn't know what to expect. It says SHARP on the back and I may be wrong about this, but I have strong doubts that the ones you find on eBay are original. I say that because I noticed that the specs on the eBay page are slightly different than the specifications you find in the original Sharp datasheet, but that could be due to the seller not knowing his merchandise. When I was playing with the SeekThermal XR, I set my mind on building a temperature calibrator and for it to be of any use, it needed a display. Because the control circuitry was on a fairly small board, I wanted to use a small LCD, but having none available I ended up using a classic 16x2 HD44780 LCD. That's when I realized I need to broaden my options when it comes to cheap displays for quick projects. It didn't took me long and I found these gems on Aliexpress for about $3.50/pcs. They're graphic, so no support for direct alpha numeric mode and they come in different colors, but usually monochrome. The information on Aliexpress is almost always sketchy, so I went for the model that could display both blue and yellow. What I didn't know at the time is that it displays blue in the top segment (48 vertical pixels) and yellow in the bottom segment (16 vertical pixels). It actually doesn't look bad and I rather like it. I've been planning for a while to build a tracking generator for my spectrum analyzer, but because time seems to be a rare commodity these days, I had to look for some quick alternatives that could get the job done. I had a crack at building several noise sources, but was not too happy with the result and since I didn't want to spend too much time on it, I went ahead and purchased one of those cheap noise sources from eBay. They currently sell for about 20 pounds and they're advertised to work well up to 1.5 GHz. I need a lot better than this, but for my current project it was enough. When buying a noise source, keep in mind that they can't replace a tracking generator. The power of the signal generated by the noise source will be spread across the entire spectrum, so every time you reduce your RBW, the displayed signal level will also drop, since less power will make its way inside the filter. It's easy to get fooled by this, so if you do get a noise source, make sure you're aware at all times of the total power that's present at the spectrum analyzer input, so you don't exceed the maximum limits. We all know that good power supplies are essential to an EE lab and we also know that the cheap ones are not the best power supplies out there, but the best don't come cheap, so I'm always on the lookout for affordable power supplies. I purchased this one several months ago, but couldn't find the time to review it until now. Tenma is a brand owned by Farnell and this particular power supply seems to be a rebranded Korad 3003D. It costs about $100 new, which is extremely cheap for a digital power supply. They have a mixed reputation so far, but they also appear to step up when issues are reported, so it might not be that bad. In the EU, the Tenma version seems to be more widely available and that's what I went for. I recently went on a hunt for a new power supply, because I needed about 2 amps for my new project, while my home made ones could only deliver 1A. 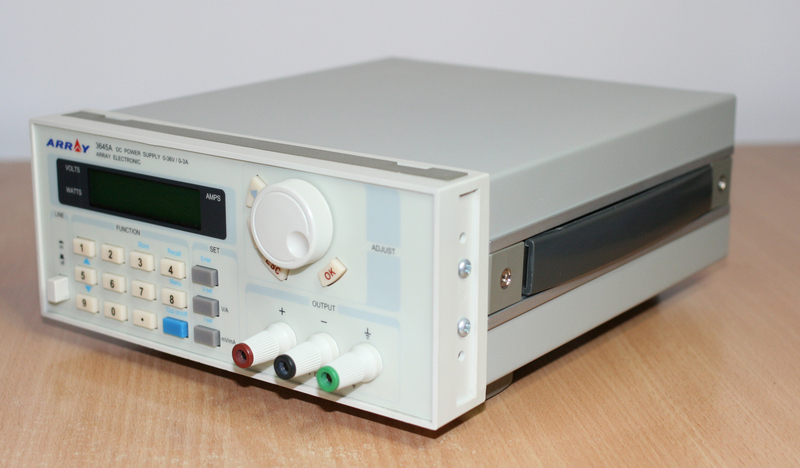 Since I'm on a budget, the choices were limited to either old equipment or cheap new equipment, so I ended up with a list of old HP/Agilent power supplies and a bunch of Chinese supplies like the Korad 5005P and the Rigol 832 in the other camp. I have to say that the most appealing one was the Rigol 832, but being such a big beast I quickly ruled against it - my bench is not wide enough for it to fit in such a way that I could comfortably use it. From my new power supply I wanted current limiting with mA resolution, digital display, over current and over voltage protection. On top of that, I wanted it to be programmable so I can automate various tests. This left me with only a handful of choices and in the end, the only one standing was the Korad 5005P, however due to expensive shipping and high bank fees (could only pay by bank transfer), I had to reconsider.